HMH Books for Young Readers, 9780547718989, 30pp. All aboard for Dreamland! Hold on to your pillow because the Goodnight Train is taking off. Roll that corner, rock that curve, and soar past mermaids, leaping sheep, and even ice-cream clouds. You won't want to miss a thing, so whatever you do, don't . . . close . . . your . . . eyes! With soothing, lyrical words and magical illustrations, June Sobel and Laura Huliska-Beith have created a nighttime fantasy that's guaranteed to make even the most resistant sleeper snuggle up tight. 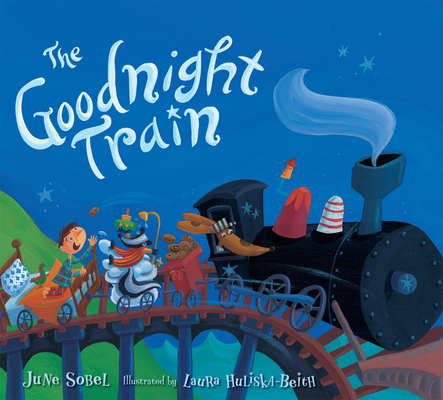 June Sobel is the talented author of The Goodnight Train and The Goodnight Train Rolls On, illustrated by Laura Huliska-Beith, B Is for Bulldozer: A Construction ABC, illustrated by Melissa Iwai, and Shiver Me Letters: A Pirate ABC, illustrated by Henry Cole. She lives in Westlake Village, California. www.junesobel.com. Laura Huliska-Beith has illustrated many popular books for children, including The Goodnight Train and The Goodnight Train Rolls On by June Sobel, The Recess Queen by Alexis O’Neill and Ten Little Ladybugs by Melanie Gerth. She lives in Kansas City, Missouri. www.laurahuliskabeith.com.